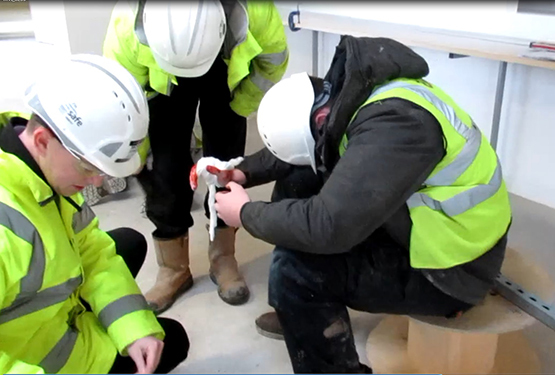 Our drill was devised to assess the response to a significant first aid incident on our project. Only the Project Manager, Safety Advisor, and the two ‘injured’ volunteers knew about the drill. The responding Site Managers were advised of the drill once they arrived at the scene. The scenario was then explained to the Site Managers that one individual had cut his finger using the saw, and his colleague had fainted when he saw the blood. What did we learn from the drill? We identified that our means of raising the alarm was insufficient. The Project Manager had to make four phone calls to mobile phones before someone answered – this was immediately identified as a serious issue. Response time and availability of first aid kit took almost four minutes. This was due to the fact that the first aid boxes were held in the site office, and our Managers were in the office with their PPE in the changing room lockers. They had to basically get all of their gear on, out of the office, and up to the first floor of the building to attend the incident. What have we done to address these points? We have allocated radios to key personnel on site, including the security guard. This means that incidents can be raised to the wider team more quickly. The security guard has a first aid kit and defibrillator available in the gatehouse. We have installed two first aid kits within the building – one on each floor. This will mean that a kit is available to our first aiders within the building in the event of an emergency and will greatly reduce the response times. Our Site Managers felt that this was a worthwhile exercise as it has highlighted a few areas for improvement.